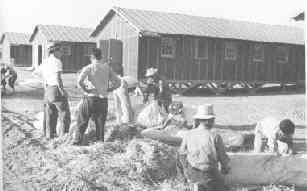 Japanese internment camps were the sites of the forced relocation and incarceration of people of Japanese ancestry in the Western United States during the Second World War and established in direct response to the Pearl Harbor attack. They remain arguably the most notorious example of war-time hysteria driving public policy decisions based on paranoia and fear-mongering than fact-based security threats. On December 7th 1941, the Japanese attacked Pearl Harbor. US citizens feared another attack and war hysteria seized the country. State representatives put pressure on President Roosevelt to take action against those of Japanese descent living in the US. On February 19th, 1942, Roosevelt signed Executive Order 9066. Under the terms of the Order, some 120,000 people of Japanese descent living in the US were removed from their homes and placed in internment camps. The US justified their action by claiming that there was a danger of those of Japanese descent spying for the Japanese. However more than two thirds of those interned were American citizens and half of them were children. None had ever shown disloyalty to the nation. In some cases family members were separated and put in different camps. During the entire war only ten people were convicted of spying for Japan and these were all Caucasian. Opened August 12, 1942.Closed November 10, 1945. Manzanar, CA – Opened March 21, 1942. Closed November 21, 1945. Peak population 10,046. Life in the Japanese internment camps was hard. Internees had only been allowed to bring with then a few possessions. In many cases they had been given just 48 hours to evacuate their homes. Consequently they were easy prey for fortune hunters who offered them far less than the market prices for the goods they could not take with them. “It was really cruel and harsh. To pack and evacuate in forty-eight hours was an impossibility. Seeing mothers completely bewildered with children crying from want and peddlers taking advantage and offering prices next to robbery made me feel like murdering those responsible without the slightest compunction in my heart.” Joseph Yoshisuke Kurihara speaking of the Terminal Island evacuation. Some internees died from inadequate medical care and the high level of emotional stress they suffered. Those taken to camps in desert areas had to cope with extremes of temperature. The camps were guarded by military personnel and those who disobeyed the rules, or who were deemed to be troublesome were sent to the Tule Lake facility located in the North California Cascade Mountains. In 1943 those who refused to take the loyalty oath were sent to Tula Lake and the camp was renamed a segregation centre. 2. Will you swear unqualified allegiance to the United States of America and faithfully defend the United States from any or all attack by foreign or domestic forces and forswear any form of allegiance or obedience to the Japanese emperor, to any other foreign government, power or organization? In December 1944 Public Proclamation number 21, which became effective in January 1945, allowed internees to return to their homes. The effects of Japanese internment camps affected all those involved. Some saw the camps as concentration camps and a violation of the writ of Habeas Corpus, others though, saw Japanese internment camps as a necessary result of Pearl Harbor. At the end of the war some remained in the US and rebuilt their lives, others though were unforgiving and returned to Japan. This article is part of our larger educational resource on World War Two. For a comprehensive list of World War 2 facts, including the primary actors in the war, causes, a comprehensive timeline, and bibliography, click here.